FOR someone who spends so much time tramping round Scotland's highest peaks, Hazel Strachan is remarkably down to earth. There's no drama, no complaints, just a fierce determination to keep on climbing the mountains she loves for as long as she can. Just minutes after walking beneath the traditional walking poles guard of honour formed by friends at the summit of Carn an Tuirc in Glenshee to mark her tenth Munro finish, she was talking about her plans for round No.11. It's not all about records for Hazel; it's simply her passion to be on these hills. She equalled the women's record number of six rounds – set by the late Geraldine Guestsmith/Howie in 1995 – on the summit of Cairn Gorm in 2014, and then went one better the following year on Geal-charn at Drumochter. Since then she has managed another three finishes. Indeed, she has bagged a round of Munros every year for the past seven years since 2012, and she shows no sign of easing up. 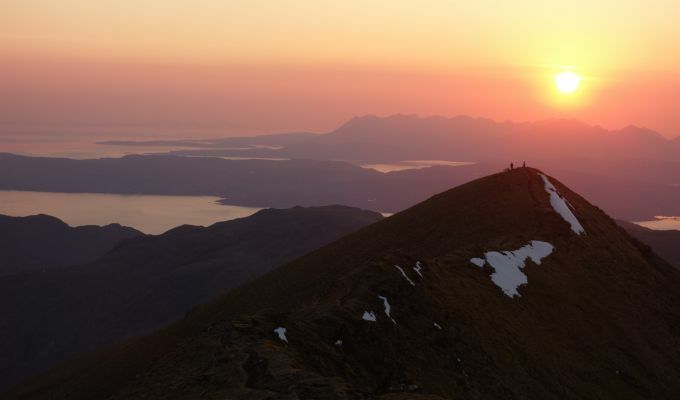 There's no temptation to move on to other hill lists, no particular thirst to get a Full House, the name given to the completion of the six main hill lists – Munros, Munro Tops, Furths (the 3,000-ft summits in England, Ireland and Wales), Corbetts, Grahams and Donalds. The Munros reign supreme in her eyes and her logic is unshakeable. Her first finish was in 2005 at the age of 37 but there was no hint of what was to follow. It had taken almost 25 years from her first ascent (Ben Vorlich at Loch Earn during a school outing): she lived on a farm and leisure time was in short supply. Her job now as a scientist with the Scottish Government – she's a variety testing and genetic resources assistant – provides more flexible hours and is more conducive to accommodating her passion for the hills. Two more rounds followed in 2008 and 2010, but it was two years after that when she decided to try and go for the women's record. Since then she has never looked back. The obvious question is whether she now aims to try to catch up with Steven Fallon, who sits on 15 rounds, but it's one that is asked often of her and she has grown somewhat weary of it. Hazel insists she has no set targets. It's just a case of keeping going and enjoying each round on its own merits. She has spent most of her Munro walking solo. Out of the 2,826 logged, she has only had company on some 200, and this includes her finishing parties and with guides for some of the Skye peaks. But this is far from a one-woman show. Her husband, Ian, plays a vital role in her mountain life. They have climbed some 30 Munros together over the years, and he continues to provide support from their motorhome, dropping her off at one location and picking her up, sometimes days later, at another. There are famous tales of Sir Hugh Munro coming off the hill and being met by his chauffeur with a hot drink at the ready. Ian provides that and more for this extraordinary Munroist, including the bonus of “a smiling face and a big hug”. As you would expect, Hazel knows her mountains intimately but she never takes anything for granted, especially when it comes to navigation, and especially in winter conditions. It's not just a case of strolling round blind, there's always work to be done. On one occasion in the Fannaichs she had to dramatically divert from her planned route in poor visibility to avoid huge cornices and find a safe way off the ridge. She's only had to bail out on five occasions because of the weather – on Beinn Bhrotain, Creag Mhor, Ben More, Stob Binnein, Beinn Sgulaird – and she admits that was down to inexperience at the time rather than any bravado in setting out. Her pace is steady and measured, no wild variations, no stop-start. Her motto: Start the day at the same pace you wish to finish. This serves her well for ultra-long days. A typical summer day will be 12 hours, in winter she will walk from sunrise to sunset, although she did endure one 15-hour epic in the midst of winter in Fisherfield for five ticks. In 2017 she decided to raise funds for mountain rescue by climbing 100 Munros in June. This involved one 19-hour day in Glen Shiel, starting at 1.30am after two hours' sleep, and taking in 14 Munros in total. She went up Ciste Dhubh first, then traversed along the Brothers and Sisters groups before dropping down to Loch Duich for coffee, then headed back along the seven Munros of the South Shiel Ridge. She may be a solo walker but she never feels alone when she is in the mountains. She is a great believer in positive energy and has experienced many moments of unusual activity. “I was walking along the summit area of Beinn Bheoil when I heard a strange humming sound coming from below. There was nothing to see, but the noise, which seemed to be travelling along around waist height, came past me and then disappeared in the opposite direction. It had come and gone in a matter of minutes. It wasn't the only time Hazel felt the angels were on her side. 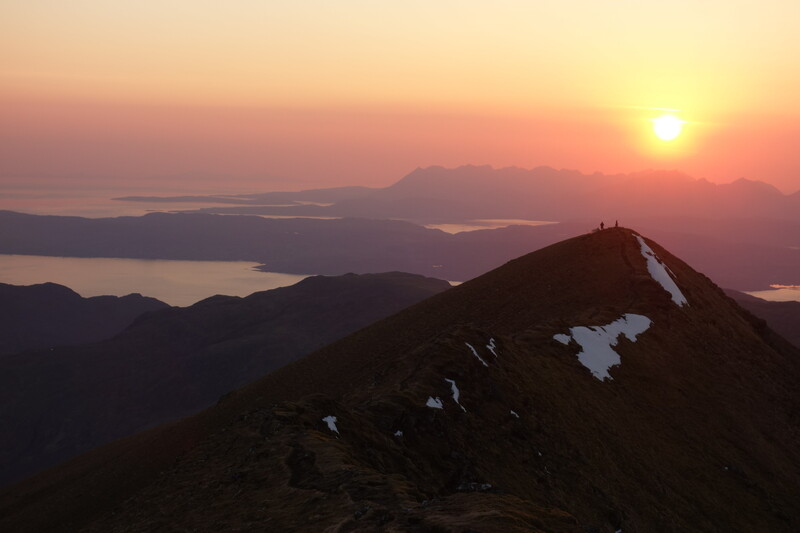 “I was descending Beinn Bhrotain on a cool day when I was hit by an overpowering smell of flowers. It was short-lived, but soon after I walked into a very sudden rise in temperature, a patch of heat. It was as though someone was saying 'We are here with you'. I believe positive energy is all around. It makes me feel grounded, connected, to have no fear. I never feel alone when I'm on the hills. There's no point in trying to tease a favourite Munro out of her. She could name any one of the 282 on any different day. That's one of the main reasons for her passion. “Every mountain has its day. They change with the seasons, with the weather. That's what I love about the Munros, the variety. You can climb the same mountain ten times and have a different experience each time. That's not to say she doesn't have favourite days out. The highlight of her tenth round, for instance, was a high-level bivvy in deep snow on a winter traverse of the Fannaichs. Her execution of the walks may have evolved over the years, but one thing that remains the same is the preparation. Like most Scottish hillwalkers she is an avid watcher of the weather, and she follows the rule of so many that if there is good, settled weather all over the country you head for the North and North-west or to Skye. The last few years have seen less of a reliance on a tent for summit camping, instead going with a bivvy. She also uses snowshoes. They have proved a boon when the soft snows of early winter have hardened, much easier on the knees. She's had her share of injury problems in the past. For a couple of years she was plagued by a pelvic problem which restricted her mountain walking but regular physio and Reiki has helped and has kept on top of the problem. It's one of the reasons she doesn't use a cycle for the hills. A trek in Alaska many years ago convinced her of the benefits of a pack raft, however, and she has been using it here on some of her outings. It means carrying the raft, lifejacket and a paddle but she has found it invaluable and plans to use it more in future. 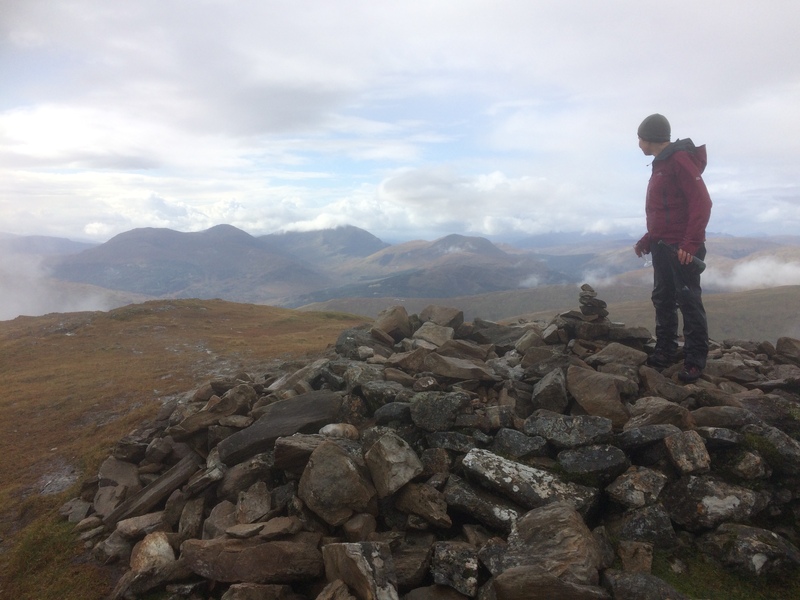 Ten rounds of Munros – she must have seen dramatic changes in the landscape in that time frame. The seemingly endless increase in bulldozed tracks for run of river hydro schemes has changed the face of many glens in the last few years, and the sight of a wind farm from virtually any high point in Scotland now are always going to be sore points for anyone who loves the mountains. But the biggest disappointment? Maybe this inspirational woman can spark a real change in these statistics.